"﻿ The Great Math Mystery"
or is it the language of the universe? ett filosofiskt , esoteriskt och mänskligt perspektiv. Join NOVA on a mathematical mystery tour—a provocative exploration of math's astonishing power across the centuries. We discover math's signature in the swirl of a nautilus shell, the whirlpool of a galaxy, and the spiral in the center of a sunflower. Math was essential to everything from the first wireless radio transmissions to the prediction and discovery of the Higgs boson and the successful landing of rovers on Mars. Astrophysicist and writer Mario Livio, along with a colorful cast of mathematicians, physicists, and engineers, follow math from Pythagoras to Einstein and beyond. It all leads to the ultimate riddle: Is math a human invention or the discovery of the language of the universe? An exploration of mathematics, including where it comes from and why it explains the physical world; and whether it’s a human invention or a hidden language of the universe. Whether we think we are good with numbers or not, we all use math in our daily lives. 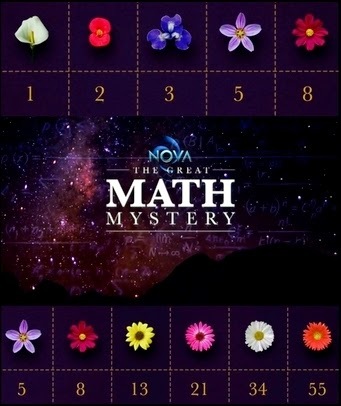 In The Great Math Mystery, NOVA sheds fascinating light on how math works in our brains and why it works so well. Math is essential in art, architecture, and music. It is evident everywhere in nature and the patterns of our world--from the spiral in the center of a sunflower, to the swirl of a nautilus shell or the whirlpool of a galaxy. Math reveals the secrets behind the elliptical orbits of the planets and the electromagnetic waves used in the first wireless radio transmissions. It predicts the discovery of the Higgs boson and the successful landing of rovers on Mars. NOVA spins through stunning examples of maths power that permeate history, drawing on Pythagoras, Galileo, Sir Isaac Newton, Albert Einstein, and more and taps into the worlds top modern-day minds, who continue to puzzle over whether maths tremendous potency is the hidden language of the universe or all in our heads. Mario Livio, a notable astrophysicist who helps operate the Hubble Space Telescope from Space Telescope Science Institute, has spent much time wrestling with such questions and sees an uncanny accuracy in the way mathematics can reveal the secrets of the universe, making it seem an inherent part of nature. On NOVA, Livio shows viewers through his Hubble research how centuries old, simple mathematical equations and groundbreaking insights on falling bodies and gravity by early scientists such as Galileo and Newton still permeate the universe as laws of Science that can be applied to distant galaxies. NOVA also looks at various patterns in nature and whether plants and animals have a fundamental ability to perceive numbers. The film looks at the intriguing series of numbers known as the Fibonacci sequence. Statistically, these occur frequently in botany, in the spirals on the bottom of pinecones, in the two sets of spirals in the seeds on sunflower heads, in the number petals on various kinds of daisies (e.g., 3, 5, 8, 13, 21, 34, 55). In another segment, Duke Universitys Elizabeth Brannon shares the latest research on how well lemurs understand quantity and the abstract essence of numbers using fascinating computer recognition tests. NOVA also looks at Pi as just one example of a vast interconnected web of mathematics that seems to reveal an often hidden and deep order to our world. Pi doesnt only have to do with circles, but appears in probability calculations and in many phenomena with wave-like characteristics. Pi tells us which colors should appear in a rainbow and how middle-C should sound on a Piano; Pi shows up in apples in the way cells grow into spherical shapes or in the brightness of a supernova. The affinity between music and math is also examined in the film in a sequence featuring acclaimed jazz bassist Esperanza Spalding, who demonstrates on her upright bass the discovery by 6th century Greek scholar Pythagoras related to simple ratios in vibrating strings of varying lengths. To him, these simple mathematical relationships produced the most beautiful, harmonious musical tones. To look at what math does to the brain, NOVA studies the MRI images of a teen math prodigy who scored a perfect 800 on the SAT for Math at age 11 and compares the neuron activation in his parietal lobes with that of kids with average performance scores. To illustrate the amazing predictive power of mathematics, NOVA selects examples that yielded highly tangible and relatable results, which are borne out all around us in the daily devices we use that require invisible waves of energy to communicate: televisions and TV remotes, radios, cell phones, satellites, baby monitors, Wi-Fi, garage door openers and GPS. All of these are a result of a set of mathematical equations published in the 1860s by a Scottish mathematical physicist, which then inspired the work of Guglielmo Marconi, who later ushered in the era of the wireless telegraph and radio at the turn of the century. NOVA also travels to CERN, home to the worlds largest and most powerful particle accelerator, located deep underground in Switzerland, to show viewers where the Higgs boson, the so-called God particle, was confirmed?another significant discovery based on mathematical predictions. Many of the world-class mathematicians and physicists featured in the film acknowledge that math feels more like an inherent truth that they discover, rather than an invention including British mathematician and Barnard College professor Dusa McDuff; mathematician and Columbia University professor Maria Chudnovsky; theoretical physicist and University of Maryland professor Jim Gates; and Christophe Golé, mathematician and Smith College professor. Others, like physicist and MIT professor Max Tegmark, go a step further, arguing that mathematics is our physical reality. Max perceives a real world that doesnt just have some mathematical properties, but only mathematical properties. As a dynamic and clever visual to demonstrate show viewers how Max might perceive the real physical world and the essence of reality to be purely mathematical, NOVA creates a special animation version of Max, shrinking him down and inserting him into a computer video game. Several others fall more into the Einstein camp who thought math to be a product of human thought, even though he wondered how it did so well in explaining the universe as we see it. The late Eugene Wigner, Nobel laureate in physics, spoke of the unreasonable effectiveness of mathematics in describing the physics of the universe, calling it a wonderful gift...we neither understand nor deserve. It is an opinion shared by particle physicist and Stanford University professor Savas Dimopoulos who calls mathematics a servant far more capable than [we] are, one that if you "ask nicely...will carry you all the way to the truth. Adam Steltzner, the lead landing engineer of NASAs Mars CURIOSITY Rover Project, demonstrates that unreasonable effectiveness using hydraulic boom lifts and custom-built ramps to show viewers how the mathematical expression of Galileos Renaissance discovery about the law of falling bodies is the same relationship used hundreds of years later by him and his team to land the Curiosity? rover on the surface of Mars. But there are also some experts such as computer scientist/physicist Stephen Wolfram and physicist/engineer Derek Abbott who point out the limitations of mathematics in explaining complex areas for which the models and prediction methods are reasonably ineffective including meteorology and weather forecasting beyond a few days, human psychology, parts of biology, such as the interaction of neurons on the brain, and financial systems like the stock market. Even Adam Steltzner admits that while engineers see math as a powerful tool, they are also keenly aware of its shortcomings. When the elegance of math meets the messiness of reality, engineers shift into the domain of approximation rather than absolutes. Precision may be sacrificed for practicality if it garners results, making mathematics appear a very human invention. For many, the answer may be that there are elements of both discovery and invention. In the end, the puzzle may never be completely resolved and the question remains a great math mystery.